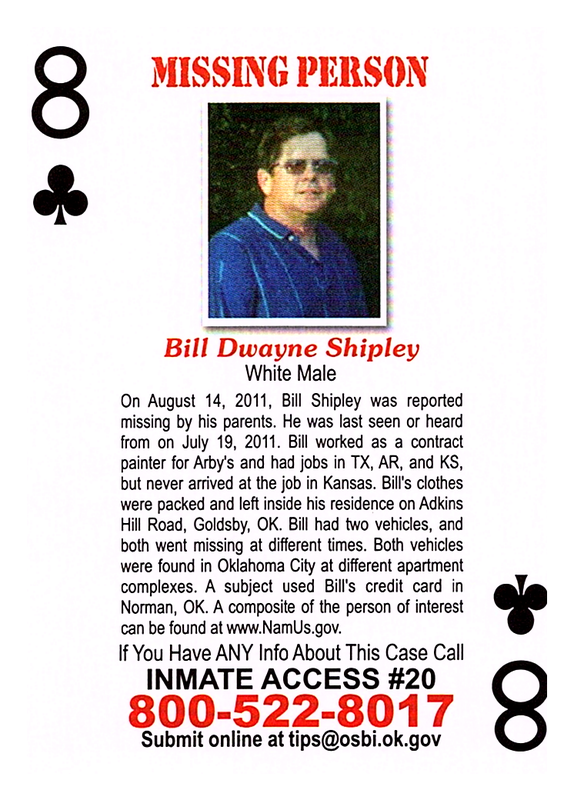 On August 14, 2011, Bill Shipley was reported missing by his parents. He was last seen or heard from on July 19, 2011. Bill worked as a contract painter for Arby's and had jobs in TX, AR, and KS, but never arrived at the job in Kansas. Bill's clothes were packed and left inside his residence on Adkins Hill Road, Goldsby, OK. Bill had two vehicles, and both went missing at different times. Both vehicles were found in Oklahoma City at different apartment complexes. A subject used Bill's credit card in Norman, OK. A composite of the person of interest can be found at www.NamUs.gov.